Sean Szymkowski November 29, 2018 Comment Now! 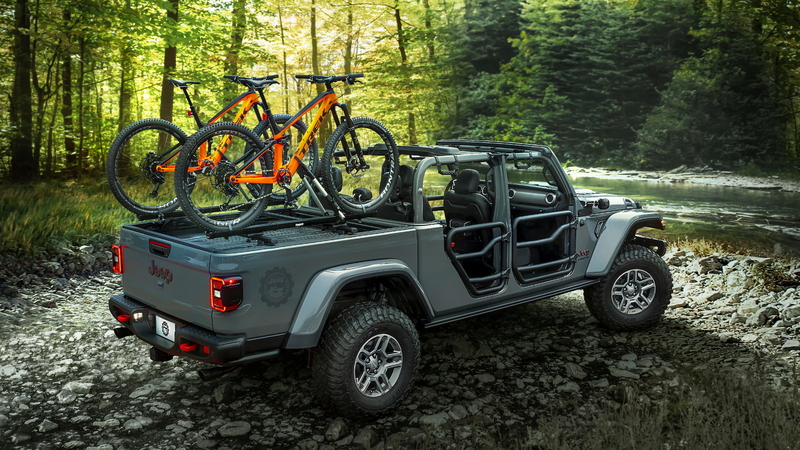 The 2020 Jeep Gladiator won't be short on accessories and light performance parts. Mopar revealed a decked-out Gladiator at the 2018 LA Auto Show on Thursday to highlight 20 of the new accessories owner can add to their future Jeep pickup. Eventually, Mopar and Jeep will offer over 200 accessories, but it chose 20 to highlight on a production-spec Gladiator. 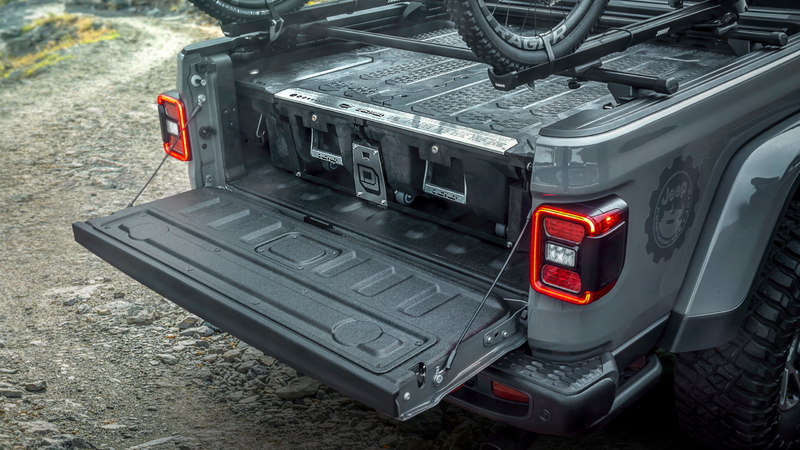 The truck on display features a Jeep Performance Parts 2.0-inch lift kit, tube doors, rock rails, and both 5- and 7-inch LED off-road lights. The Gladiator's bed features bed-mounted cross rails that work with a Mopar bicycle carrier and a bed-storage system provides greater organization. The accessory includes lockable and sliding doors to store items, notably. 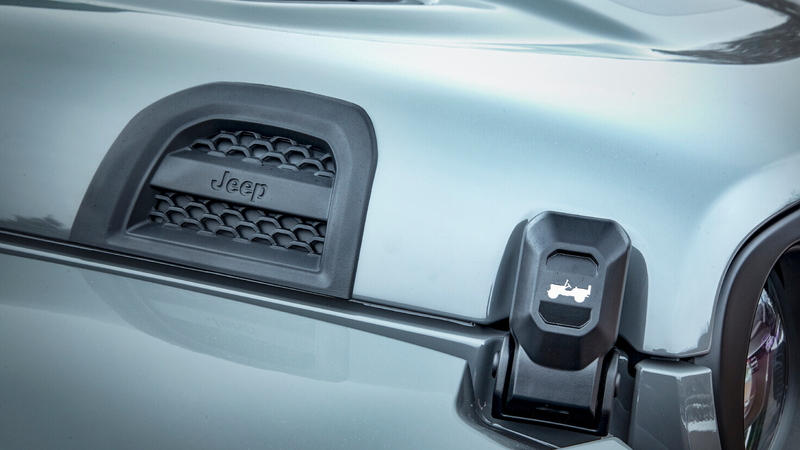 And Jeep's 2-inch tube doors look mighty cool equipped on the Gladiator. Light performance modifications are present, courtesy of Mopar, too. A cold-air intake and cat-back exhaust increase horsepower and torque but an undisclosed figure. Though, it's surely minimal. All Gladiators will feature a familiar 3.6-liter V-6 engine at launch, which makes 285 horsepower and 260 pound-feet of torque. Buyers also have the option of either a 6-speed manual or an 8-speed automatic transmission. Other Mopar accessories the brand showed off include bed ramps, a bedliner for the 5-foot steel bed, door sill guards, exterior graphics, Katzkin seats with Jeep logo in Tungsten stitching, 17-inch beadlock-capable wheels, and winch-capable steel bumpers with Rubicon and “Stubby” bumper options. 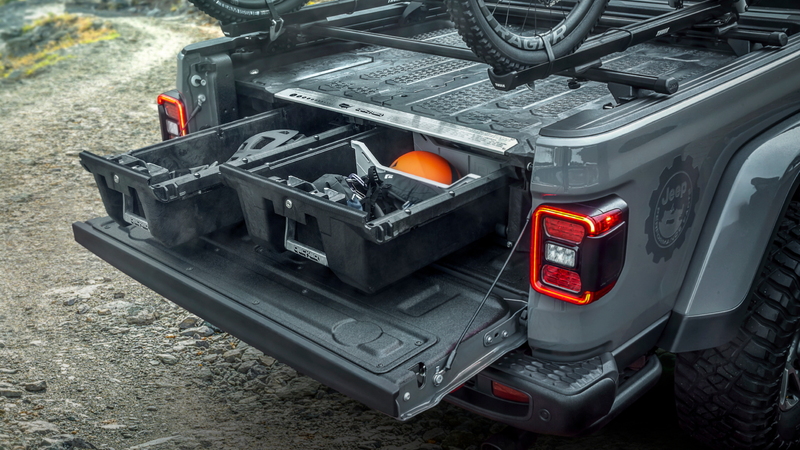 All of the accessories compliment the truck's off-road prowess, despite somewhat compromised breakover angles. Standard Gladiators feature four-wheel drive and a part-time two-speed transfer case. Rubicon models gain a larger transfer case, Dana 44 axles with electronic differential locks, 33-inch all-terrain tires wrapped around 17-inch alloy wheels, and disconnecting sway bars. 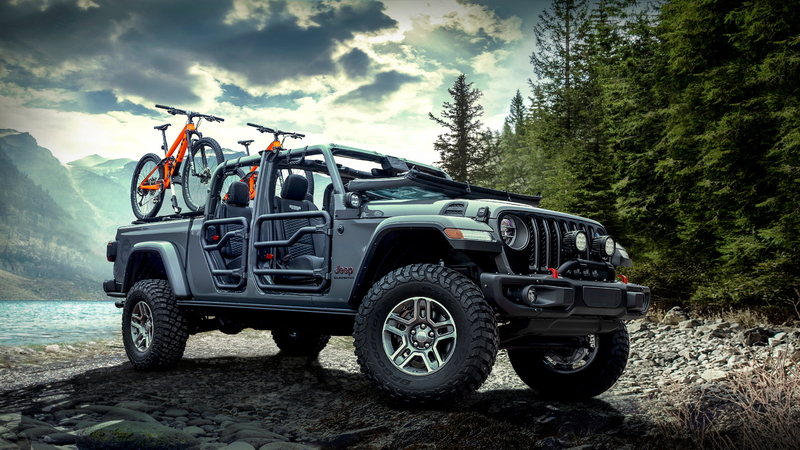 The full catalog of Jeep and Mopar accessories will be available when the Gladiator launches in the second quarter of 2019.